ExpiredRobotics Summer Camps with LEGO® Education at University Chapel, UBC – July to August 2017, Vancouver, B.C. Afternoon Session (1:00pm-3:00pm): Full Robotics Program for all Grade levels, with more active teamwork events such as Competition Games and Challenge Missions. Typically for Grades 1-2 students, but based on assessed level of competency with LEGO building, coding and teamwork skills. 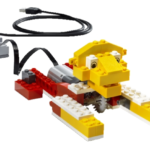 Kids use LEGO WeDo 1.0 kits to build and operate a variety of mechanical constructions. Advanced students in this level proceed to Scratch based software and more complex builds. Typically for Grades 2-4 students, but based on assessed level of competency with LEGO building, coding and teamwork skills. 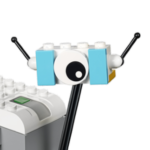 Kids use LEGO WeDo 2.0 kits with Bluetooth connectivity to iPads/Chromebooks to build and operate a variety of mechanical constructions. Advanced students in this level proceed to Scratch based software and more complex builds. Typically for Grades 4-8 students, but based on assessed level of competency with LEGO building, coding and teamwork skills. 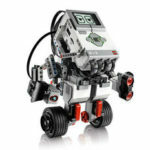 Kids use LEGO Mindstorms Education kits with to build and operate a variety of complex robotic constructions. Advanced students in this level proceed to RobotC graphical and code based software and more complex builds. Top students are selected to join Robotics Competitions such as FIRST LEGO League and BCIT Gearbots Code Challenge.